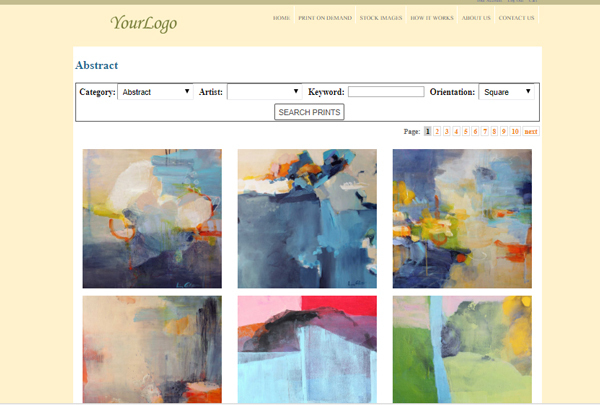 With the wholesale feature you can allow your users to create project for their customers to review. To begin with the user will want to create an account and login so they can start building their first project. 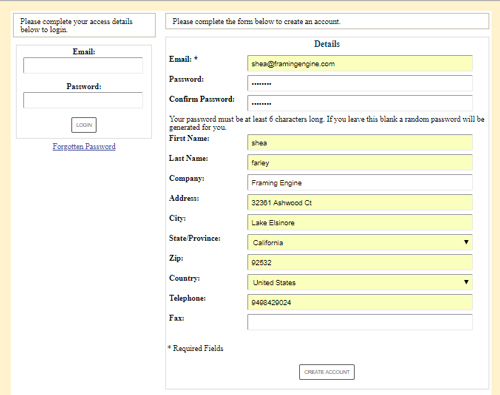 Once the account has been created you will want to login. 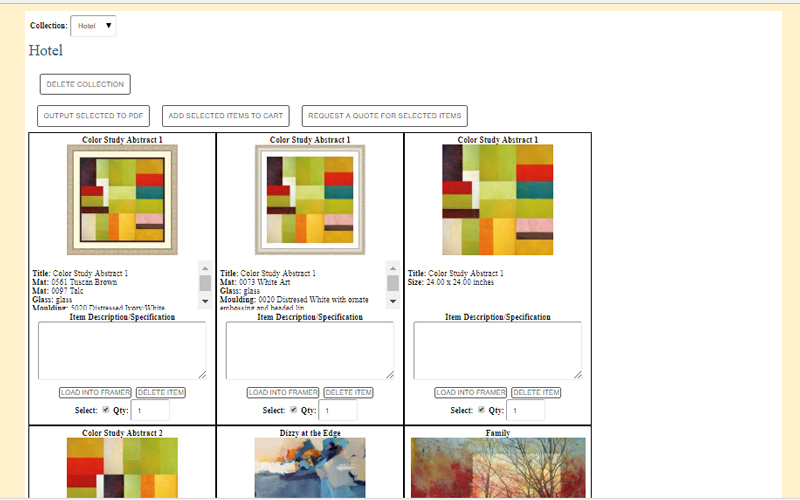 When you are logged in you can now select from the different art and photo options. 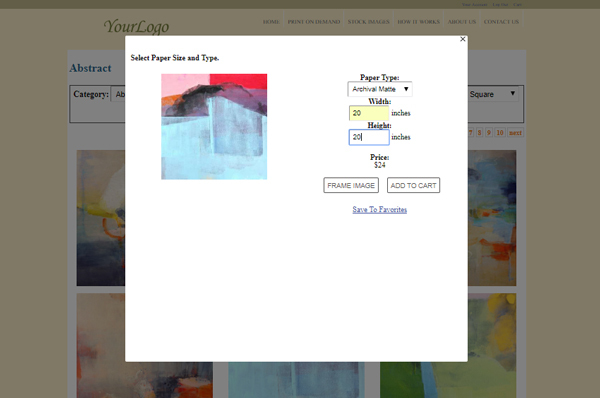 To the left you can see we are shopping the Print on Demand option > Abstract > square. The site owner can also offer their own internal Print on Demand or Stock Image feed. Once you find an image you are interested in you will select the image. After selecting the image you will be provided a popup that will offer the user all of the paper types chosen by the site owner and an option to enter either the height or width and the system will auto populate the other side based on the aspect ratio of the selected image. Once you are set with the paper type and size you can then save it to your project. When the "Save to favorites" options load you can either create a new project or add the item to an existing project. When you select the project you are saving the image to you can then add a comment about the image or location you think it will look good to view later. 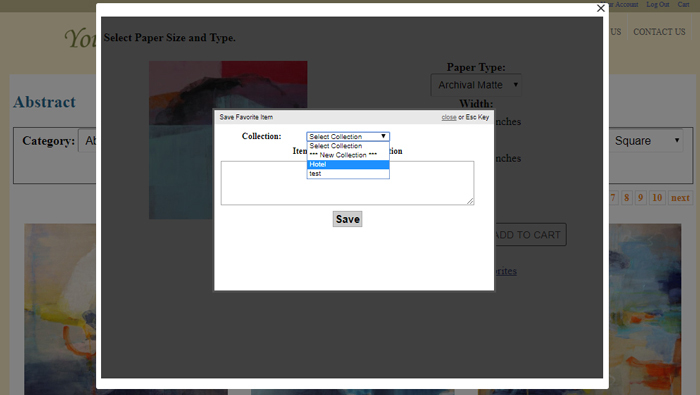 After you click to save the item it will prompt you to continue browsing or go to collection. When you proceed to the collection you will see all of the images you have added to this project. You will notice an option to load the image into the the framer so you can frame each image in a couple different designs to present to the client. Once you have completed setting up all of the options you would like to present the client you will find an option to export to PDF file. This will allow you to download the file and send via email. Once you have confirmed the items to order you can submit the items to the site owner for a price quote. Once the site owner receives the quote request they will price the items and send the quote back. You will receive an email alerting you to the quote. You will proceed to the website and login to your account. From your account page you will find all of your projects, albums you may have created, quotes, and pending quotes. You can then select the recent quote for review and either load it into the cart or request a new quote to change the request.